Help Lord Vivec reward those who assisted in restoring his divine power. Lord Vivec wants to reward those who helped restore his power and save Vvardenfell from Barbas and Clavicus Vile. He asked me to help him accomplish that. Retrieve the Archcanon's Signet from the Archcanon's Office. Meet Vivec at his statue on the Temple Canton. Reward those who helped restore Vivec's power. This quest starts as a continuation of your conversation with Vivec at the end of Divine Restoration. Leave the palace and go to the Archcanon's Office. The Archcanon's Signet will be upstairs in a lockbox. There will also be quest markers pointing you to a Strange Mirror and the Archcanon's Journal (with updates on the construction). Both contain descriptions of Barbas, and the journal implies that he is to blame for the accidents at the construction site, like the one you helped out with in Divine Conundrum. The first to be rewarded is Overseer Shiralas. She is given recharged blessing stones for the construction site. "Overseer Shiralas, you sacrificed your Blessing Stones to aid the Warrior-Poet. Well done! Take these recharged stones and finish building my city - after relaxing with your patient wife." Next is Barilzar. His reward is some amount of gemstones, each with a tiny bit of divine energy in them. "Your knowledge of the mysteries of my brother Sotha Sil and the intricate twists and turns of portal magic were invaluable. Take this and use it well to further your experiments." Next is Canon Llevule. He is rewarded by being promoted to Archcanon. "Archcanon Tarvus served us well until his death. But when I was most in need of assistance, Canon Llevule rose to the occasion. Now rise once more - as Archcanon Llevule!" The last is you. Vivec calls you forward, saying "In every poem, it's the last stanza that holds the most meaning. Once a stranger in our land, now a friend forever - step forward!" NPCs attending the ceremony are dependent upon which quests/quest lines you have completed. Possible attendees: Sun-in-Shadow, Naryu Virian, Llayne Sadri, Drelyth Hleran, Narsis Dren, and Revus Demnevanni. Seryn is also present at the ceremony, but not mentioned by Vivec. Vivec asked me to retrieve the Archcanon's Signet from Tarvus's office in the Hall of Wisdom. 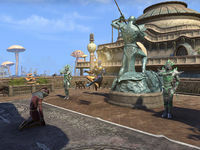 Vivec told me to meet him at the city's central canton, near the statue erected in his honor, after I retrieved the Archcanon's Signet. I should talk to Vivec and let him know I found the signet so that he can continue his ceremony with the assembled crowd. Overseer Shiralas gave me the Blessing Stones Vivec needed and helped protect the cantons during the disaster. I should reach into the sack and give her her reward. Barilzar taught me about the transfer of divine energy and helped me get into the Clockwork City. I should reach into the sack and find his reward. Without Canon Llevule, I never would have come to Vivec's aid. I should reach into the sack and see what reward Vivec has decided to bestow upon him. Finishes quest Lord Vivec has called me forth. I should present myself and talk to him.